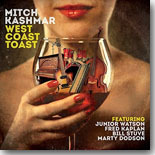 Mitch Kashmar may not be as well-known as other California harp blowers, but his West Coast Toast album on Delta Groove will show you that he's a solid bluesman in his own right. It's this month's Pick Hit. Dave Keller is back with more of his tasty soulful blues, this time with a Tastee-Tone release, Right Back Atcha, our Surprise pick of the month. Our Flashback feature this month takes a look back at a classic album from 1995, Blue Streak, by the late, great Luther Allison. Our What's New section features quick looks at a whole bunch of new harmonica-heavy CDs, plus reviews of new CDs from The Joey Gilmore Band, Cee Cee James, Elam McKnight, Little Mike, The Temprees, Sari Schorr, Reggie Wayne Morris, Big Dave McLean, Teresa James, Levee Town, The Bob Lanza Blues Band, Peach and the Almost Blues Band, and more .